severe deficiencies or is not a case of malnutrition.At times, the reason for delayed development could be metabolic disorders,too. In most cases, the delay in achieving the landmarks of growth can be taken care of by improving the dietary habits of your child and incorporating more of Vitamin, Mineral , protein and fiber rich food in your diet, as opposed to junk food or fast snacks to fill up you kids tummy. Adding a tasty nutritional drink to your child’s daily diet which can be consumed in between meals is a good idea, too.One product that can help compensate for most dietary deficiencies your child has is the newly launched, 'Horlicks Growth plus". Children belonging to the age bracket of 3 to 9 years should consume it on a daily basis in order to catch up on the lagging growth. The recommended daily intake of Horlicks is 96 grams and this can be taken in 2 to 3 divided servings.You can dissolve Horlicks growth plus either in Water or Milk.This is not meant for consumption by children who are younger than 3 years. Iron: It is important to prevent anemia in kids. Iron is important for healthy formation of Red blood cells in your body. Vitamin D: This again contributes to healthy bones along with the mineral Calcium. Vitamin D ensures the uptake of Calcium by bones. Vitamin A: This Vitamin is essential for good eyesight and good skin. Vitamin C: This is important for healthy joints and gums since this helps in synthesis of Collagen in your body. This is rich in lots f potent antioxidants,too. Zinc: Zinc helps in repair and regenerative processes. The multi-vitamin complex present in Horlicks helps to give your child a stronger immune system. 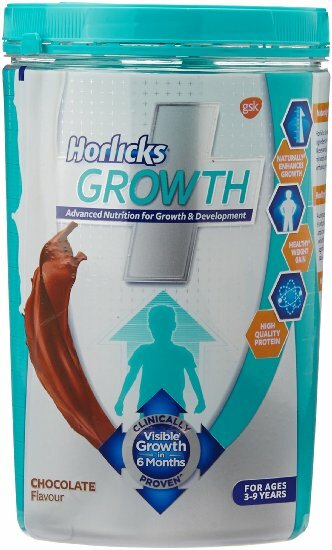 Horlicks Growth Plus claims to let your child catch up on the Growth in just 6 months. The fun part is your kid can enjoy the nutritious drink in two flavours, that is, Chocolate and Vanilla.You can either take Horlicks in warm milk or cold milk as per your choice.Therefore, I strongly recommend Horlicks Growth plus as a nutritional supplement for your kid who is in his or her growing years.